If you have driven down Commercial Street in Portola lately, you may have noticed that the project under development, the Old Town Portola Event Center, located on the east side of the Dickson Realty Office where the bowling alley fire occurred, has picked up steam. 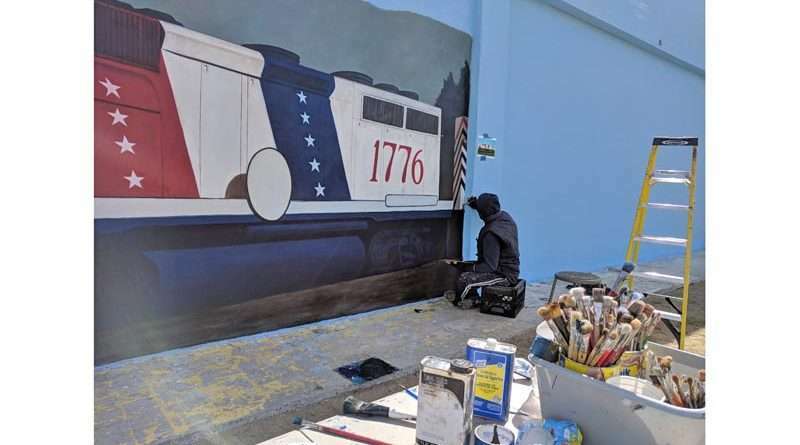 Muralist Rafael Blanco has begun work on the first of five panels, which consist of colorful depictions of various locomotives, with the first panel showing off the WP1776. The work can only be done when the weather cooperates, as there is a minimum of 50 degrees needed for temperatures conducive to painting the mural. Upon completion, planned in early July, the development will be an outdoor event center created for the use of citizens of Portola and surrounding areas. The cost of the project will be $150,000, $75,000 of which has already been contributed, with all funds raised as private donations, according to project organizers. At this time, a final fund raising drive is being initiated to acquire the necessary dollars to complete the project. A part of the fundraising effort will be an opportunity for any individual or organization to contribute a minimum of $100 to help fund the project. Project organizers give their thanks to the generosity of Chilcoot Monument owner Scott Arterburn, who has made it possible for each donation to be recognized in the form of a finished piece of masonry embedded at the entry to the event center, engraved with the donor’s name and amount donated. For those that feel that the project dedicated to the benefit and beautification of Portola is something that they would like to be a part of, organizers ask for tax deductible donation be mailed to Old Town Portola Event Center, P.O. Box 1143, Portola, CA, 96122. Donors may also include a note with their choice of engraving.